Researchers studying Martian meteorites have discovered methane just under the surface. The gas, common in Earth's ecosystems, is more evidence that the red planet once held life - and maybe still does. When scientists cracked open a half dozen ancient Martian meteorites last year, they discovered notable amounts of methane - a gas which, on Earth, is heavily associated with the presence of living organisms. The discovery adds yet more evidence to the theory that Mars was once a life-supporting planet - and possibly still is. The paper, published in Nature Communications, describes how the researchers took six meteorites, composed of basic igneous rock, and crushed them, liberating a surprising amount of methane from below the surface. The meteorites are old, and no doubt Mars has changed a great deal since these rocks left their home to crash on ours, but the presence of the gas give us an idea of what the red planet must have once looked like. Methane, it should be said, can be produced through non-organic processes. On Earth, however, the gas is primarily produced by living things. Not only that, but some single-celled organisms thrive on a diet of methane, meaning that presence of the gas not only indicates the presence of basic life, but maybe a thriving ecosystem, as well. 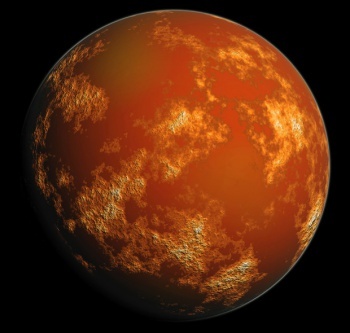 In fact, the possibility of methane on the red planet is one of the inciting factors in many Mars missions. Last year, NASA's Curiosity observed wafts of methane emerging from the planet's surface, suggesting that the gas is still be produced on the planet today. The surface of Mars is often considered hostile to life. A thin atmosphere allows cosmic radiation to blast the planet constantly, and temperatures drop as low as -90C. The meteorite findings - combined with Curiosity's - suggest there may be a much more hospitable environment just below the planet's red soil, protected from the extremes of the surface. A few months ago, NASA claimed that alien life will be found within the next 10 to 20 years. Are we closer than ever to a Close Encounter? And will our cosmic neighbours be anything like what we imagined?